An interview at the Gloucester Folk Museum in 2006 conducted by Pete Wilson of BBC Radio Gloucestershire. Featuring Ken Ledran (Chairman Joe Meek Society at the time), Robb Huxley and Mick Holder (Meek recording artists – Saxons/Tornados), Sandra Meek (Joe’s niece) plus Derek Davies who worked with Joe at MEB in Gloucester. 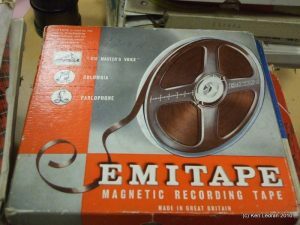 The Foresters recorded for Joe Meek at 304 Holloway Road and their recordings are in the tea chest tapes. The interview with Radio Gloucestershire’s Pete Wilson in October 2003 is fascinating because the group are from Joe Meek’s neck of the woods and they give a fascinating account of their time at 304 and playing at various venues.